They say a picture’s worth a thousand words. 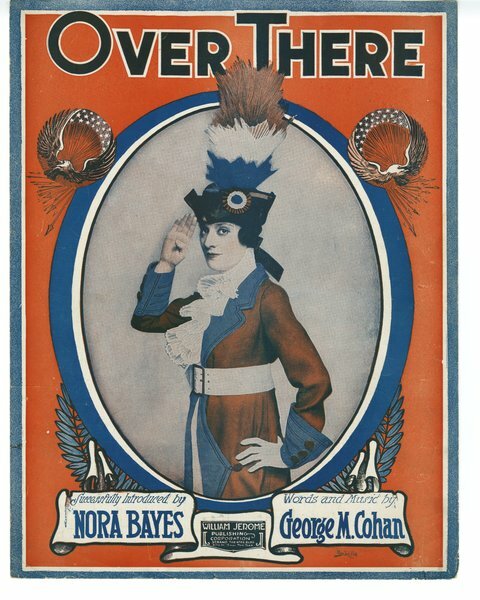 Below I have five sheet music covers, all of the same song (“Over There” by George M. Cohan) from the same years (1917-18), in arrangements published by two separate houses (William Jerome Publishing Corp. and Leo Feist, Inc.). Embedded in these five covers is the early history of “Over There” advertising and production. By the end of 1917, “Over There” was the #1 song of the year. By the end of the war, it had sold over 2 million copies. By 1936, Cohan was awarded the Congressional Gold Medal. He definitely had a song. The first and most famous group to perform and record the song was Billy Murray & The American Quartet, Murray appropriately being the supreme interpreter of Cohan’s music. Eager to capitalize on the popularity of the song, sheet music was quickly produced. The first cover from William Jerome Publishing Corp. features a portrait of Nora Bayes, famous singer and comedienne of the Vaudeville and Broadway circuits. After Cohan performed the song in her dressing room, she included it in her act, becoming one of the song’s greatest pluggers. On this patriotic red, white, and blue cover, Bayes wears a stylized military uniform reminiscent of the British Redcoats along with a hat including feathers colored in order of the French tricolor flag (…backwards), thus incorporating the the major Allies of World War I. Eagles and stars, symbols of America, surround her portrait. The second cover (also from William Jerome Publishing Corp.) features another famous performer of the song, William J. Reilly. The U.S. Navy sailor, stationed on the battleship U.S.S. Michigan, was also a popular singer. 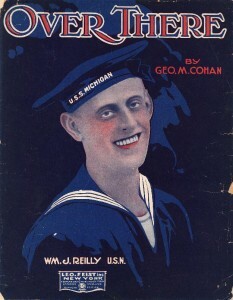 Like the Nora Bayes cover, this one incorporates the red, white, and blue of the American flag, a famous performer, and a U.S. military connection, though, as Reilly was actually a sailor in the Navy, this cover carries a heavier political connotation by putting a face and a name to the “son of liberty,” “Yanks,” and “Johnnie” mentioned in the song. The third cover is a copy of the previous one except for one detail: the publisher is not William Jerome, but Leo Feist, Inc. By October 1917, Jerome had sold over 440,000 copies of the song, and it was a hit feature in five New York shows (including productions at the Hippodrome and the Winter Garden). After hearing the song himself, Leo Feist offered Jerome $10,000 for the song. Jerome said no. Feist offered $15,000, $20,000, $25,000. Finally Jerome said, “it’s gotta be in cash.” After paying this high price (over $458,000 now, the highest price paid for a song at the time), Feist quickly put the piece to market, keeping the same cover and aggressively pushing the song, reportedly grossing over $30,000 in new orders within thirty days. The fourth cover brings another American icon into the story. Norman Rockwell, a popular painter and illustrator for the Saturday Evening Post, created this painting for Life Magazine‘s January 31, 1918 issue. The picture presents four American infantrymen animatedly and excitedly singing and playing a banjo-ukelele with tents in the background. Although lacking in historical detail (would soldiers really be singing like this in an active combat zone? ), the tag line above presents Feist’s pitch for the piece: “Your Song – My Song – Our Boys’ Song!” Notably, no red, white, or blue is featured on this cover. The final cover features four soldiers holding their hats in the air and guns to their shoulders while marching across the page in an Broadway-like gesture, sketched by Henry Hutt, an American illustrator. Like the Bayes’ cover, this one features the colors of the three major Allies (Britain, France, and the U.S.), with a sideways French tricolor as the backdrop. Further emphasizing the unifying quality of the song, the tagline reads “This great world song hit now has both French and English lyrics.” Clearly Feist was marketing “Over There” as a worldwide hit. And in an age of war and patriotism, how could a true American or Frenchman NOT buy this song? 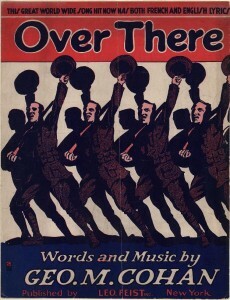 Thus through five pictures we can trace the early production of the song “Over There,” including the advertising and propaganda that furthered its reputation as a patriotic American anthem. Cohan, George M. “Over There.” New York: Leo Feist, Inc., 1917. [Dancing soldiers cover]. Duke University Libraries Digital Collections (n1170). Cohan, George M. “Over There.” New York: Leo Feist, Inc., 1917. [Norman Rockwell cover]. Mississippi State University Libraries (Physical ID: 32278011441759). Cohan, George M. “Over There.” New York: Leo Feist, Inc., 1917. [William J. Reilly cover]. Duke University Libraries Digital Collections (n0967). 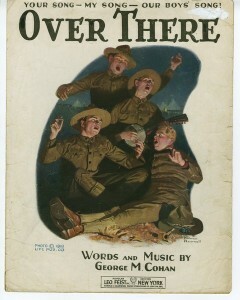 Cohan, George M. “Over There.” New York: William Jerome Publishing Corp., 1917. [Nora Bayes cover]. Duke University Libraries Digital Collections (n1186). 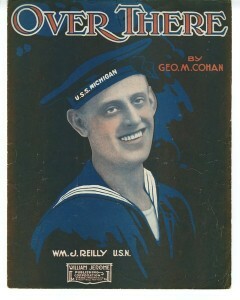 Cohan, George M. “Over There.” New York: William Jerome Publishing Corp., 1917. [William J. Reilly cover]. Johns Hopkins University, Levy Sheet Music Collection. http://jhir.library.jhu.edu/handle/1774.2/22148. Performing Arts Encyclopedia, s.v. “Over There.” Washington, D.C.: Library of Congress, 2014. http://lcweb2.loc.gov/diglib/ihas/loc.natlib.ihas.200000015/default.html (accessed April 27, 2015). Sullivan, Steve. Encyclopedia of Great Popular Song Recordings, Volume 1. Lanham, MD: Scarecrow Press, Inc., 2013.